DIY home improvements can’t be avoided. It would be a total waste of money to hire someone to do something very small and relatively easy. You must, in one way or another, learn how to use the basic tools that are essential in doing home projects. The hammer is your best friend when engaging in these sorts of projects. But have you ever been frustrated about using it? Face it, the hammer is only as good as you use it since it uses your own force. You also have to balance your strength holding the hammer and the nail. And if you miss, OUCH! Retire your hammer to easy and basic woodworking tasks and switch to nail guns. Nail guns are available in different sizes and styles while there are also models that specialize in roofing, framing and siding tasks. There are 2 basic types of nail guns that are often used in different home projects. The first one is a nail gun that uses an air compressor and hose. 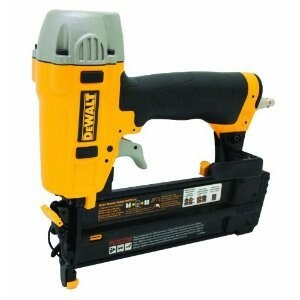 This type of nail guns comes with an assortment of nails to simplify any repairs and projects. Another type of nail gun is more portable as it does not need any air compressor or hose. It uses compressed gas and battery to function. Choose the right nail gun for you and make your job a lot easier and faster. Intended for delicate finishing jobs when working with wood, the Makita AF505 Brad Nailer fires gauge 18 brad nails with lengths ranging from ⅝ to 2 inches. It is particularly suited for fastening wall panels, window and door casings, as well as base and crown moldings and trims. It is also useful when working on cabinets, furniture, picture frames, scale models, and other arts and crafts works. The brad nailer’s nail magazine has a capacity of 100 pieces, which reduces downtime caused by frequent nail reloads. A pair of clear windows on the magazine acts as a reload indicator by clearly showing the level of nails remaining within. This prevents dry firing which could damage the machine. Using the AF505 makes your work convenient as it includes all the features expected from a good nail gun. Depth-of-drive adjustment is standard with the nailer and it comes with an adjustment dial that does not require any tool. With this, you can countersink your nails, flush them with the wood, or allow their heads to protrude from the wood surface. The nosepiece of the nailer is a tough cast and machined piece that easily absorbs the rigors of the jobsite. It can, however, be fitted with a no-mar rubber tip that protects your sensitive work from scratches and nicks. Working with the Makita AF505 Brad Nailer is convenient as it is lightweight and, with its weight evenly distributed, feels balanced when held. Its grip is wrapped with a soft non-slip material for a comfortable and secure hold. With an exhaust port that can be rotated up to 360°, exhaust air can be directed away from you regardless of your position. If the machine is not is use, a sky hook that rotates up to 180° can be used to hang it on your work belt. The nailer operates at an air pressure ranging from 60 to 115 PSIG. You can opt for the higher pressure when driving your nails into hardwoods such as oak. Compressed air goes into the machine via a ¼-inch inlet port at the heel of the grip handle. Dimensions are 10¼” D x 9⅜” H x 2½” W, while weight is 7 pounds. Shooting gauge 18 brad nails with lengths varying from 3/8 to 2 inches, the Freeman PBR50 18 Gauge Brad Nailer is ideal for fastening trims and moldings, furniture and cabinet works, as well as crafts and hobbies. With its strong and sturdy built, professionals will find no problem working the entire day with the nailer. Do-it-yourselfers, on the other hand, will find it easy to use because of its ergonomic design and minimal weight of less than 3 lbs. This is further enhanced with its handle that is wrapped with rubber for a soft and secure hold, and an adjustable exhaust that rotates 360°. The nailer’s magazine is made of anodized aluminum. It can hold up to 100 pieces of nails, which reduces downtime due to reloading. 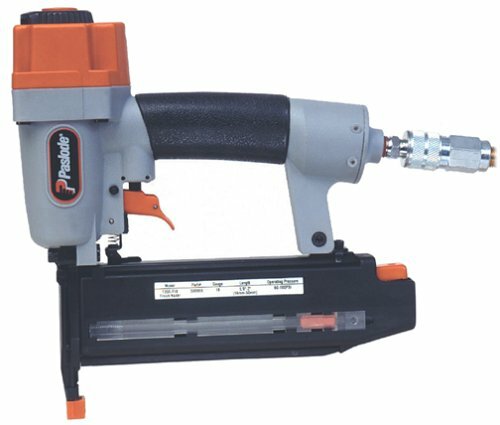 With a reload indicator, dry firing that can damage both the nailer and your work is eliminated. Fresh nails are loaded into the magazine on its side. Its left panel is actually a cover that can be slid down for reloading. The Freeman PBR50 fires its nails in single sequential mode only, which is appropriate for its purpose of fastening small and delicate items. The only way to fire is by depressing the nozzle of the nailer against your work and pulling the trigger. To fire a second shot, you need first to release the trigger in full and pull the nozzle back from your work. 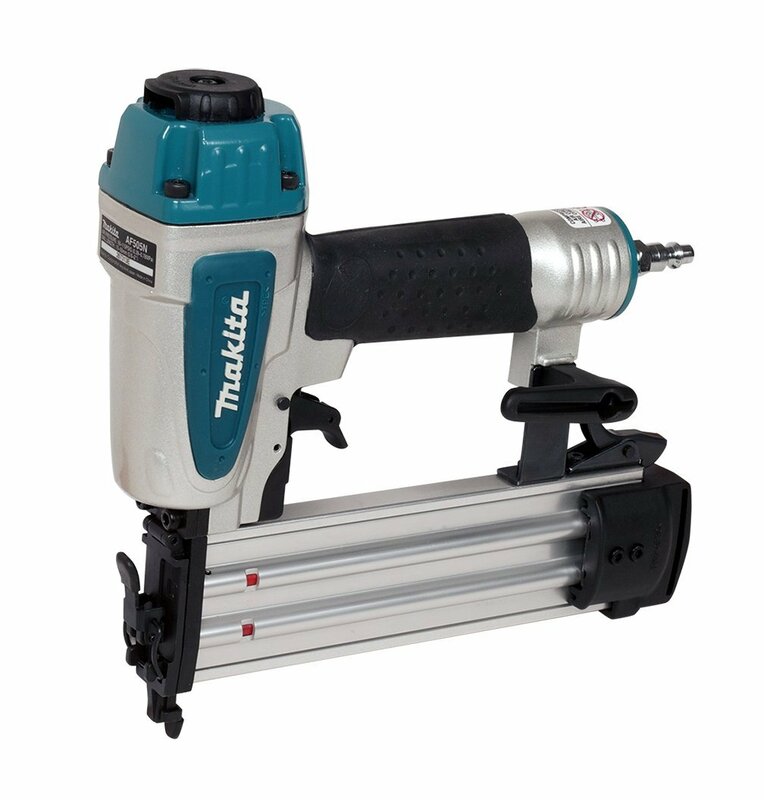 Most of the internal parts of the nailer are made of anodized aluminum including the cylinder and rail. For durability, the driver blade is in one piece. Teflon oil-less O-rings seal all areas where compressed air might leak. Although you do not need to lubricate the nailer daily, adding oil after long periods of use is recommended for a longer service life. Oil is added via the machine’s air line connection. Operating pressure is at 60 to 100 PSI, which is strong enough to drive your nails into hardwoods and engineered woods. The internal parts of the nailer are protected from dust and debris that might come with air by an air filter. 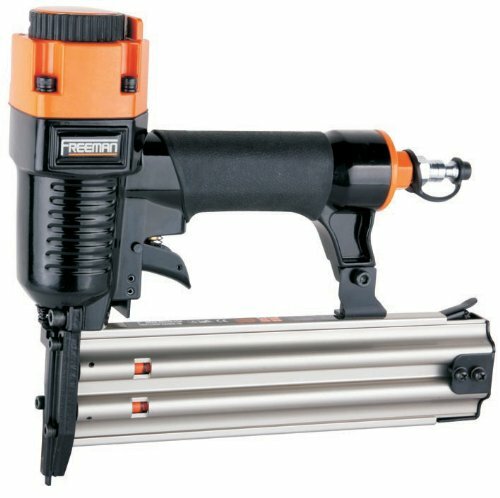 The Freeman PBR50 18 gauge Brad Nailer is about 10″ x 2″ x 9″ in size. With a casing that is constructed out of aluminum, the Hitachi NT50AE2 Brad Nailer weighs in at only 2.2 pounds, making it a comfort to work with even if you have to work all day. Measuring 10″ L x 9.25″ H x 2.38″ W, it is easy to maneuver and deploy even in cramped spaces. The nailer is designed to shoot 18 gauge brad nails with lengths starting at 5/8 up to 2 inches, and with head sizes ranging from 0.075 – 1.9 millimeters. Its nail magazine can accommodate approximately 100 brad nails, depending on their diameter. This reduces the number of times you will have to reload thus minimizing its downtime. To further help reduce this, reloading is made easy with the bottom-loading magazine. Also, a visual indicator allows you to monitor the remaining brad nails. Featuring two firing options, you can choose between intermittent and continuous firing. All you need to do is slide the option control with your hand to make a choice. Intermittent firing is intended for precise nail placement. The nail gun will only fire after you press its nozzle against the spot where you want the nail and squeeze the trigger. Continuous firing allows you to fire the nails quicker, although with less accuracy. By simply bumping the nozzle against you work, the nailer sinks in the brad nails. Depth of drive is adjustable tool-free. A dial is incorporated near the nozzle of the nail gun, which you can turn either clockwise or counterclockwise to vary the depth of the nails. Although it does not jam frequently, in case it does, its jam release mechanism is easy to operate for a quick clearing. 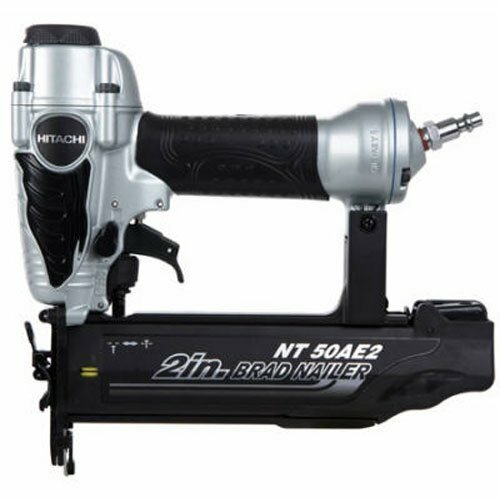 The Hitachi NT50AE2 Brad Nailer is a pneumatic tool that runs on an air pressure of 70 – 120 PSI. At 100 PSI, it consumes 0.025 cu. ft. per cycle. The exhaust of the pressurized air exits at the back of the tool through a vent that can be adjusted to any direction. Encased in a magnesium body, the DeWalt DWFP12231 Brad Nailer Kit is a lightweight yet durable tool that is more than able to withstand the usually harsh conditions of a workplace environment. Owing to this, working with the tool will not cause arm fatigue. Within the casing is an equally durable motor. It is an oil-free type which means it does not require too much maintenance, and neither will it stain your sensitive projects. The motor generates sufficient power to drive brad nails with lengths ranging from 5/8 to 2 inches, with a gauge rating of 18. This means it is ideal for use in fastening finish moldings, making picture frames, and constructing arts and crafts projects. Nails are held in a magazine with a capacity of 100 pieces. Nails are driven with a sequential style trigger, which means that the nozzle of the nailer is first pressed against your work before you can fire. This is a safer option and it also provides for a more precise placement of your nails, a feature necessary when doing finishing work. The depth of brads nails can be regulated with the nailer’s depth-of-drive adjustment mechanism that is equipped with detents for precise nail depth. The tip of the nozzle is fitted with a removable non-marring nose to protect your work surface. When not in use, you can remove the nose and store it in a cavity within the tool. At the other end of the nailer is a rear exhaust where air is vented when shooting nails. It can be rotated to direct the exhaust away from you or you work. To assure a tight and secure hold on the nailer, its handle is wrapped with an anti-slip rubber grip that is also comfortable to grasp. At its heel is an adjustable hook for hanging the tool on your work belt. Measurements of the DeWalt DWFP12231 Brad Nailer Kit are 4″ W x 13″ H x 13″ D, while weight is less than 5 pounds. Equipped with a powerful motor, the Paslode 500959 T200 Brad Nailer easily sinks gauge 18 nails measuring from 5/8 to 2.0 inches into the hardest of woods. Smooth and galvanized nails of this size leave holes that are barely visible on the wood. They also keep the wood from splitting. This makes the machine ideal for working with moldings, both crown and base, stair spindles, panels, sidings, and other decorative trims. Weighing a mere 2.1 pounds, the Paslode T200 is arguably the lightest brad nailer in its class, thus it does not cause undue fatigue even when working with overhead projects for an entire day. In addition to this, its handle is wrapped with a soft rubberized grip that offers a comfortable and non-slip hold. Created with a long, slender, and streamlined nose, the nailer car easily reach hard-to-access corners and nooks that typically are inaccessible to most brad nailers. This helps you put the nails exactly where you want them even in tight spots. Depth of drive is adjustable allowing you use the tool for temporary fastenings. Although this is not tool-free, Paslode includes an Allen wrench for the purpose. A quick clear nose provides for a means to easily remove any jammed nail. It also comes with a no mar tip to protect your sensitive work from scratches. The exhaust vent is fully adjustable to direct the blasts of air away from both you and your work. The Paslode 500959 T200 Brad Nailer has an operating pressure ranging from 70 to 100 PSI. With this much pressure, you are assured that your nails can go as deep as you want them to. Given a nail capacity of 100 pieces that are collated with glue, downtime due to reloading is minimized. The measurements of the machine are 2.38″ W x 9.75″ D x 9.75″ H.